U.S. Army Reprint Manual from 1980. 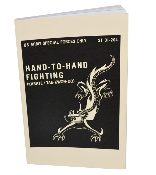 Includes techniques of Karate & Tae-Kwon-Do with some how-to pictures, also includes programs of instruction. One of the major goal of Special Forces training is the development and maintenance of skills required to insure maximum chance of survival and mission accomplishment. Many of the missions require operating deep within enemy territory where the possibility of engaging in hand-to-hand combat increases. The soldier trained only in the use of his basic weapon loses his effectiveness if his weapon fails to fire or breaks. The soldier skilled in hand-to-hand fighting can continue to defend himself, engage the enemy, and accomplish the mission.